For my roommate’s birthday brunch in July I made a white wine sangria that was well received, and for the meal I tinkered with an egg casserole dish. As I’m not much of a breakfast person, I had never made one before. It was super simple and also got high marks, so I made it again this week when I had my friend Leigh over for breakfast for dinner. Preheat the oven to 325 degrees F. Prepare a 7"x7" casserole dish or 8"x8" pan by coating with non-stick baking spray, and set aside. In medium skillet or 10" omelet pan, cook sausage, minced garlic and bell pepper together over medium-low heat for 7-8 minutes, or until sausage is cooked through. 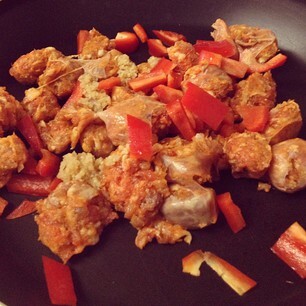 The fat from the sausages should be enough to grease the pan, but stir often. For the last minute, turn up heat to medium and brown (but don’t burn) the contents of the skillet. 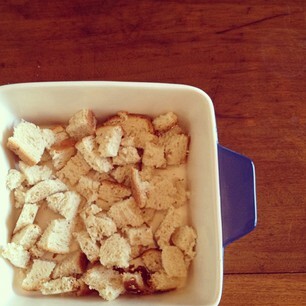 Meanwhile, cube the bread and spread in the bottom of the baking pan. When sausage mixture is done, spread evenly atop the bread. In medium bowl, whisk eggs together until blended. Pour slowly over the meat and bread. Using a fork or spoon, press contents of pan down under the egg mixture until all is coated, but do not stir. Let sit for 5 minutes. Place pan in the oven and bake for 15-20 minutes, until center of casserole is firm to touch. Yields 4-6 servings. The first time I made this casserole I made two large (9"x13") pans worth, and I used ground sausage and onions. That incarnation tasted delicious, but I wanted a bite of spiciness in this one, and that’s why I changed it up. You could also add cheese… really, it’s open to interpretation. And good news, it’s delicious heated up the day after for lunch! Recommended for: fans of egg dishes, brunch experiments, breakfast for dinner (accompanied by pancakes! ), and anyone who likes a little bit of a bite to their morning dishes. I'm looking for something to make for brunch tomorrow and this looks like it. Thanks for sharing. Mmmmm! This sounds like something my mom makes for Christmas breakfast. Minus the red peppers. I used to adore them but ever since I was pregnant I haven't been able to eat them. sausage! how good it not be good? does sound good! I like breakfast for supper! 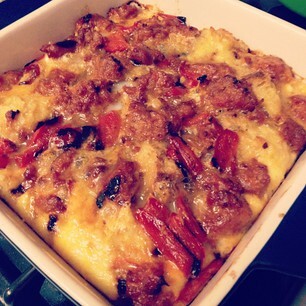 I love breakfast casseroles for brunch and for dinner! And great news that it heats up well the next day. Great for a special breakfast. Have a great week! I love these sort of dishes. Liviania: Not gonna lie, you just made me drool. That sounds DELICIOUS! I would actually cook this for breakfast! A wedge like this is all I need! That looks yummy! My mom used to make an overnight breakfast casserole every year on Christmas Eve, and this reminds me a little bit of it--sausage, bread, eggs. I love to addition of the red bell pepper, too. We love breakfast for dinner. Your casserole looks delicious. I'd love that for any meal, any time of the day! That looks so good. My mother made something similar, too, for holiday brunches. I love that this reheats well -- a perfect casserole. A few mushrooms and some diced red peppers and I'd be more than smiling. And no dairy> Excellent. Thanks.